To celebrate the start of whale watching season, Rottnest Express is offering an early bird special for the ultimate wildlife day out. Book one adult by September 15 for the Whale Watch Adventure Tour and get 50% off the second adult fare. Local kids (4-12 years) who are registered as Quokka Club members travel FREE on Tuesdays, Wednesdays and Thursdays for the duration of the whale watching season – even during the school holidays! The open-air Eco Express boat provides unrivalled access to the migrating humpback whales and other local marine life, including Australian sea lions, New Zealand fur seals, dolphins and osprey. Join our ‘whale whisperers’ as they navigate the waters and provide expert commentary along the way. Last season, the crew located whales on an amazing 99 per cent of tours! 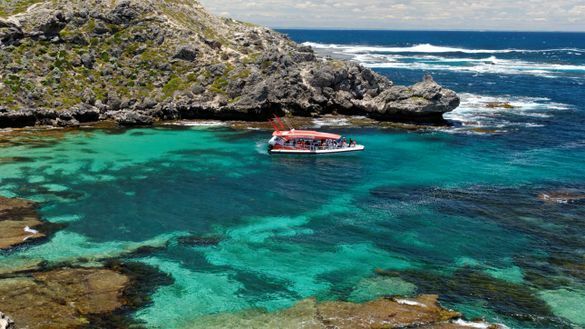 The Rottnest Express Adventure Boat tours operate daily from 15 September through to mid-November, with morning and afternoon whale-watching experiences available. Day trip fares are $136 (ex Fremantle) or $170 (ex Perth) for adults. Book online at www.rottnestexpress.com.au or call 1300 467 688. Further information of fares and conditions is here. Journey Beyond owns and operates a suite of iconic tourism brands, including Rottnest Express, Cruise Whitsundays, The Ghan and the Indian Pacific. For more information, visit www.journeybeyond.com.au.